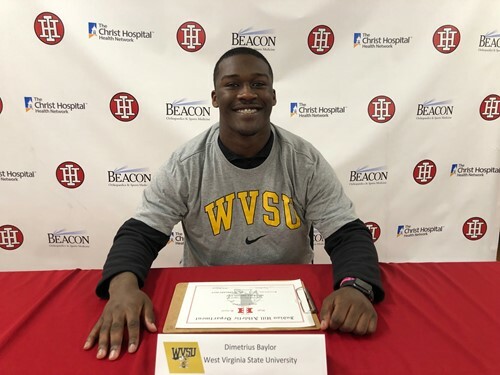 Indian Hill High School (IHHS) congratulates IHHS Senior Dimetrius Baylor for committing to attend West Virginia State University. Baylor was surrounded by friends and family for the official announcement during a football signing ceremony at IHHS Wednesday, February 6, 2019. Baylor was First Team All-CHL, First Team All-SW Ohio, Honorable Mention All-State, Team Offensive MVP, league leader in rushing (second all time for a season with 1,460 yards), and second in the league in scoring with 25 touchdowns (second all time for a season with 25). Photo caption: IHHS Senior Dimetrius Baylor committed to West Virginia State University during a signing ceremony Wednesday, February 6.